Your assurance engagements completed thoroughly, consistently and securely. How secure is my work? We are an NZ company providing content and software to audit professionals. Our main clients are Chartered Accountants who perform assurance and compliance engagements for a large range of clients including schools, charities of all sizes, small to listed public companies, and trust accounts for real estate agents, PTEs and Body-Corps. Our goal is to create secure, up to date and efficient compliance and review systems with great professional customer service. We have a proven history of looking after client data, fast resolution of issues and maximum up-time. 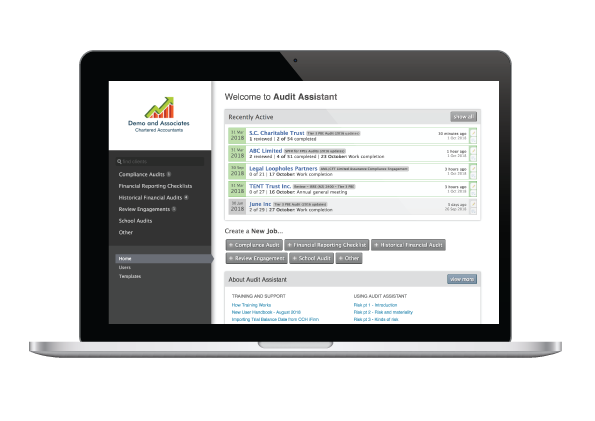 Audit Assistant is a service that provides an Audit, Compliance, Compilation and Review Engagement documentation system. All of our content is kept up-to-date with New Zealand and Australian standards and translates well into SME Audit work anywhere in the world where International Auditing Standards apply. Audit Assistant not only makes the auditing process streamlined and easy for auditors but for all parties involved. If this sounds right for you, check out our available packages and customer testimonials.